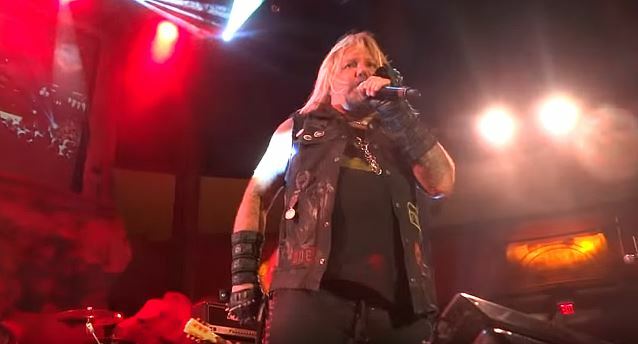 MÖTLEY CRÜE singer Vince Neil played a free show on Saturday, January 16 at Wolf Den at Mohegan Sun in Uncasville, Connecticut — his first official solo performance after the completion of the band's "The Final Tour". "Thanks to all the fans that came out last night to #mohegansun Had a great time!" Neil tweeted after the concert. "Wolfs Den was rockin!!" Neil's live backing band continues to consist of bassist Dana Strum and Jeff Blando (both of SLAUGHTER) and drummer Zoltan Chaney. Neil's setlist for his solo shows includes CRÜE hits "Dr. Feelgood", "Kickstart My Heart" and "Girls Girls Girls". "We kind of have to," he said in a 2014 interview. "I'd be disappointed as a fan if I went and saw me and I didn't play some of the hits…. Every song you're going to know. It's rock 'n' roll." Neil last week played a private solo show at the second annual Cisco Enterprise Executive Connection in Maui, Hawaii. MÖTLEY CRÜE played the final two shows of its 34-year career last month, and announced that a full-length concert film will be released this year. The movie will include exclusive interviews and behind-the-scenes footage of the last week of the band's five-continent tour, which began in July 2014. Neil told the Las Vegas Review-Journal in a recent interview that he doesn't plan on slowing down anytime soon. "I'm excited about the future," Vince said. "I've had a solo band for the last 15 or so years, maybe longer than that. And when MÖTLEY doesn't tour, I'm always on tour with my solo band." He continued: "The thing is, though, it's exciting because, you know, MÖTLEY CRÜE takes up 99 percent of your time. And now you get MÖTLEY out of the picture, and now you can really focus on solo career and other businesses and anything you want to do. So it's kind of an exciting time, thinking about what I could do with all this time I have now. It's going to be sad that we're no longer playing together, but you know, it's progress, I guess."